Some part of your design should contain a frame of some description, it could be stamped, drawn, doodled, die-cut or whatever your imagination dictates. I cut a distressed frame with my Silhouette and on a piece of card stamped the hares, a freebie from Craft Stamper and added some foliage with a CI stamp. I dusted some blue ink for the sky and attached it behind the frame and popped it onto the card. This is also cut on my Silhouette and I loved it but thought it probably wasn't CAS enough. 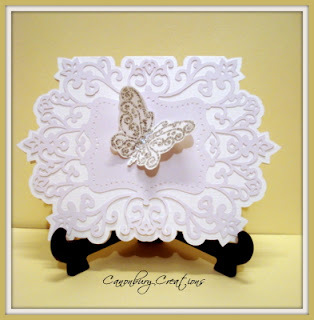 It was a white linen base card and the cut out is white card which shows up a different tone. Butterfly stamped and glittered with white/silver embossing glitter. 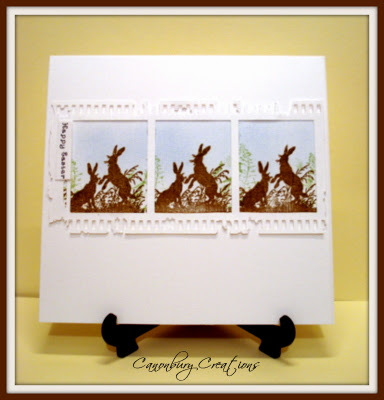 Your cards are a breath of fresh air and the first, with the March hares is adorable. I also love the rabbits Valerie! Both are beautiful, but the first one is my favourite! These are gorgeous Val, I love that distressed frame... it's looks just terrific! I love both cards Val, but the hares in the frame card is superb!! Thanks for the lovely warm welcome as one of your followers, and thank you so much for joining my little handful on my blog. what a fabulous set of cards, val... the second one is just stunning!! Love the distressed frame on the first card...gotta check that out in the Silhouette store. Don't you LOVE your Silhouette?!! I don't know what I did without mine! Love the intricacy of the second card. Beautiful cards this week! Nice to see you playing with your Silhouette, love both of your cards both beautifully designed and the first one with the tattered film strip is just fabulous. New furniture how lovely enjoy ! Great cards Val, love the hares, just perfect for easter. Your other card is amazing, I've only just heard about Silhouettes as my neighbour has one. Love it, ....what a great idea! Thank you very much Valerie for visiting my blog and for the nice comment you've left about my card!